On Sunday, May 27th, at the conclusion of the Monastery's Spring Training Intensive, The Monastery Store officially launched its Tenkozan Line—handmade, natural plant-dyed textiles from the Monastery Stitchery and unique, handmade Buddhist altar images from the Monastery Statuary. Tenkozan, or "Heavenly Light Mountain," is the religious name of Tremper Mountain, where Zen Mountain Monastery is located. For several years we’ve featured birdhouse gourds, incense holders, beeswax candles and of course honey from our own hives. All of these products and more have celebrated age-old traditions of handcraft using resources cultivated and harvested from our own grounds. As you’ll see and read below, a number of these endeavors have been fermenting and evolving behind the scenes and we’re very excited to now share them with the wider world. For now, these items are only available at our on-site store on Sundays from 12:45-1:45pm at 871 Plank Road, Mount Tremper, NY 12457. We’ll expand to offering them online as quantities become available. The soil, sunlight, rain, and air on Tremper Mountain have been transformed and made manifest in glorious golds, blues, yellows and reds on cloth. In a process that’s part science, part art and completely magical, leaves, roots, lichens and bark growing at Zen Mountain Monastery are undergoing a metamorphosis, blossoming into natural dyes. This alchemy makes up the color palette for the aprons, scarves, napkins and rakusu cases we’re creating in the new Monastery Stitchery. As some may remember, several years ago Shugen Roshi held a mondo announcing that there would be changes to the way Dharma Communications functioned. He wanted people to get out from behind their desks and for residents and retreat participants to practice skills that didn’t involve computers. He urged us to think of ways to use our hands to make real objects. He wanted to change the direction of The Monastery Store. Barely were the words out of his mouth, when my mind raced to the word, “indigo.” It wasn’t long before Shoan and I were sitting in the Temple library mapping out a scenario—grow indigo on the mountain, harvest, process and voilà. A true blue was born! And true gold. Marigolds from the Monastery garden that would otherwise be composted create the most amazing golds, yellows, greens and browns. Onion skins from the Temple kitchen produce golds and greens. Realizing the pink from the Monastery kitchen’s avocado pits is still a work in progress. And this spring, we collected lichen that was growing on the Locust tree that fell next to the main building in a late winter storm. Her giving will continue as the lichen dye will offer reds and purples, of course this is after a three-month long fermentation process including ammonia and daily agitation. Each pot of Indigo grown in the orchard feels like life being borne as it ferments and a lovely bronze/blue foam appears on top—a sign it is ready to use. The cloth goes in, turns yellow in the dye and then, before our very eyes, turns blue when its pulled out of the pot and oxygen hits it. As I once said to Roshi, there are miracles happening in the Jizo House dye studio on a daily basis. We are in our third season, growing indigo on the mountain. The countless moments of trial and error have led to deep appreciation of the nature of transforming a plant leaf into color. Possibly even more important, have been the moments of truth in which we were faced with personal decisions such as whether or not use commercially processed natural dyes to supplement our harvest. I know that I have used the word “miracle” too many times already in this blog post but it is truly how it feels every single time we make a pot of dye. It is so simple: plant, water, heat. And the results are so incredible. By this I don’t mean just the finished objects, which are quite beautiful, but the whole process. Roshi’s vision of offering new skills and experiences to residents and retreat participants has been realized. More than once, the person assigned to the dye studio has come back to me to tell me how meaningful it was to work in there. Perhaps it isn’t just the plants that are being transformed. An electrician enters a small room on the third floor of Zen Mountain Monastery. This room was once the library and is being used as a staging area for a renovation. At the back of the room by the window, behind spools of wire and other signs of progress, is a work table on which sits a sewing machine. The electrician and the resident operating the sewing machine regard each other in pleasant silence. On the table are stacked eco-printed fabric samples and various versions of a shoulder bag pattern. This is the ZMM Stitchery in-utero, so to speak. The dreams of Monastics and residents to have a dedicated sewing space to fill The Monastery Store with handmade wonders, had to start somewhere. For over a decade, there was a monastic here named Mary Kaijun Mold who became “the stitchery”. Curtains were made, robes mended, sitting cushions restuffed and reinforced. Sewing machines were stored in the women’s restroom and set up when necessary. Kaijun and the occasional sangha member served the sewing needs of Zen Mountain Monastery—and filled all the available time doing so. It would have been hard to imagine four more machines and an entire studio expressly for the task, let alone many devoted hours of work time for design and sewing. Two years hence from the storage-area-stitching-room with the single machine, the creative vision and output of The Monastery Stitchery have blossomed. When you put your hand to a plant-dyed apron, bag or scarf from The Monastery Stitchery, you are touching the energies and efforts of a whole team of Monastery residents and sangha members from the community. Individuals with talents ranging from design, pattern making, and sewing; to dyeing and eco-printing; to marketing and display have been working with materials from right here on Mount Tremper to create products that are functional, beautiful, local and ethically made. 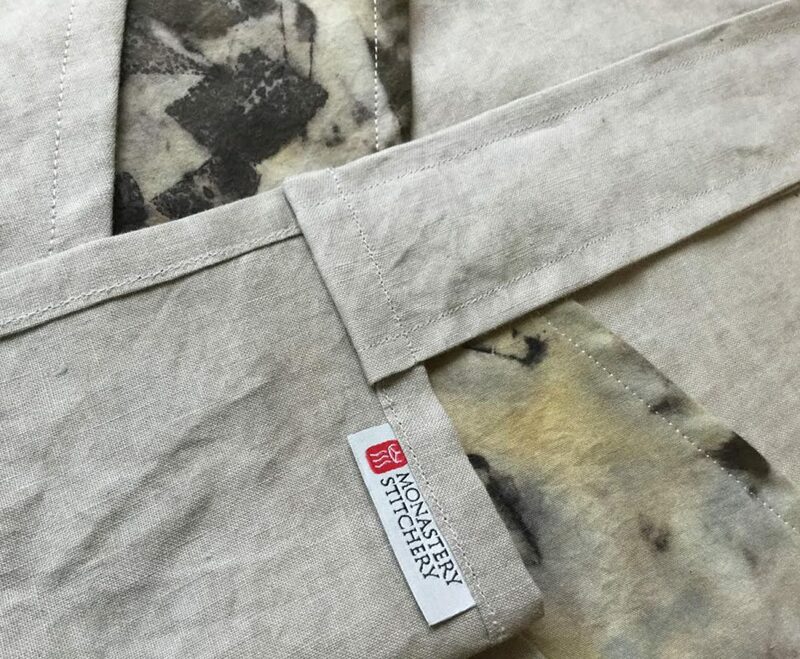 On Sunday May 27th, The Monastery Store will begin offering the first four products developed at The Monastery Stitchery: shibori dyed table napkins, two variations on Japanese style aprons, colorful scarves, and loop-handled bags. All the dyes are created in our Dye Studio from plants cultivated or harvested here at the Monastery. The fabrics are organic cotton, linen, hemp and blends thereof; or repurposed prints donated by sangha. In the works for future seasons are unisex linen sitting pants, work tunics and samue - and who could predict what else? At The Monastery Stitchery monastics, students, and short term residents work together learning to use the best of what the mountain offers and creating truly lasting and beautiful objects. In addition to The Monastery Store’s adventures in stitching and dying, we’ve also be busy casting! Designing molds of magnanimous Bodhisattva icons, we are creating a unique line of images suitable for your sacred space at home or personal altar. 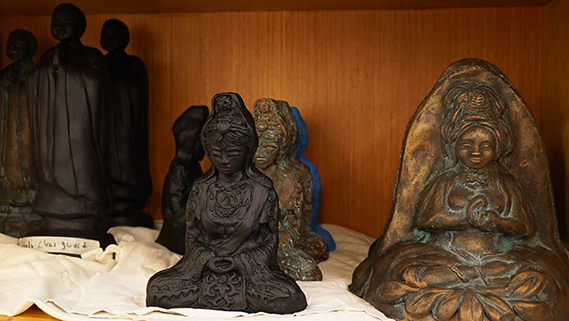 Monastery monastics and residents worked to create original images from plasteline clay, then we set about exploring different casting techniques, trying to achieve consistent results using non-toxic materials. Each image is hand cast in white gypsum cement and then finished with either a simple flat paint or a bronze coating. Bronze images use a splash of patina, giving a timeless, antique quality to each piece. Embedded in each image is a teaching in Roshi’s own hand. The Monastery Stitchery, Statuary, and Dye Studio are still coming into being so many people have been integral to this unfolding. A special thank you to Claudia Young, fusei forth, Ikyo Love, Kaishin Jamieson, Takusei Twichell, Chisho Bollier, Jean Ann Wertz, Doug Hull, Keimu Adolfson, Shoshin Chester, Seiyu Lanaghan, Matthew Yanchuk, Corinne Lilie, Tanya Prather, Hatty Cresse, Annelisse Fifi, Diego Mireles, Scrap Wrenn, Ryan Leonard, and all of you who have spent caretaking in the stitchery, the dye studio or the statuary! Additional gratitude to the many beings who planted, tended, harvested and processed the indigo and other dye plants in the Monastery's orchards and garden.